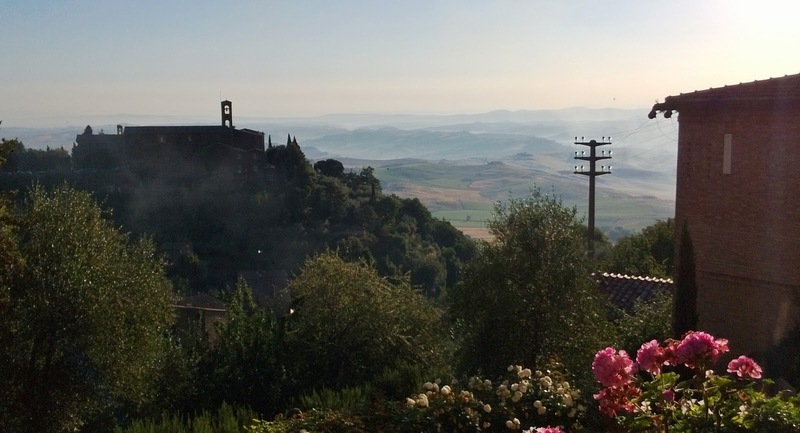 Our whistle-stop tour of Tuscany had already exceeded expectation. 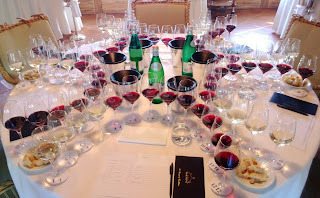 The rustic delights of Castellare in Chianti and Villa S. Anna in Montepulciano had set the bar extremely high. Nonetheless, the regard with which all our previous hosts has spoken of our next destination filled us with anticipation. Next stop: Castelli Banfi. Banfi needs little introduction. It is the largest single wine estate in Europe and produces wines which are not only consistently of international acclaim, but has also securely held the number one spot in my wife's favourite wines for the past three years. This was always going to be fun. Before we begin, a quick word on the journey. Just over an hour from Montepulciano, the distance as the crow flies is remarkably short. The endless twisting, undulating roads so beloved of cyclists here (on the way down, at least) means it's hard to get anywhere quickly in these parts. It also means you are regularly awarded spectacular panoramic views of one of the world's most treasured wine producing regions. We spotted what looked like a small, localised rainstorm in the distance, which looked utterly surreal against the blue sky filling the rest of the scene. Sure enough, we ended up driving straight through the middle of it. I mention this as the brief, intense shower was over in mere minutes leaving no sign behind whatsoever. Appreciating these micro-climatic conditions undoubtably helps with an understanding of viticulture in this sometimes challenging environment. Upon arrival we are greeted by Dante, who is graciously forgiving of our tardiness and takes us on a tour of the winery and cellars. I have never seen wine production on this scale before, and brace myself for being disenchanted by an industrial approach to what I've always considered an art. The opposite happens. The application of technology in pursuit of excellence appeals immediately to my (admittedly geeky) curiosity. Automatic optical sorting tables? Check. Temperature controlled cellars specifically for malolactic fermentation? Check. Electro-magnetic dialysis machines to drop impurities out of the wines without filtration? Check check check! If NASA made wine, I suspect they would visit Banfi for tips before they started. Banfi have even invented their own oak / stainless-steel hybrid barrels to achieve the best of both worlds: temperature control during fermentation, integrated oak influence in the wines, and ease of cleaning. The oak effectively floats on the stainless steel frame, allowing for expansion due to temperature increase during fermentation. It's a work of genius, and I immediately recognise the effort which has gone into solving this problem. The easy route would've been stainless all the way, but wouldn't have given the same results. After exploring the winery and cellars, we are led to a tasting room with a flight of wines waiting for us. It was quite a sight! Undoubtably, the star of the show was the Poggio all'Oro Brunello Riserva 2007. This single vineyard polyclonal Brunello (the local clone of Sangiovese) is a wine of serious depth. Years of oak and bottle maturation have produced a rounded wine bursting with leathery tertiary notes, yet retaining that glint of youthful freshness which makes the wine immediately accessible. At dinner, we had the unexpected pleasure of dining with John and Pam Mariani, the owners of the estate. Meeting with John gave us an immediate understanding of the attention to detail evident in the Banfi winery. He has a razor-sharp mind combined with technical insight which would be intimidating, were he not so passionate with it. Listening to the way he has spent his career devising technological solutions to what are, in the main part, emotional and artistic challenges is a true inspiration. And I must also mention Pam, with her charming humility, who seemed every bit as excited that we were interested in their wines as we were to be there. I also discovered that the castle also houses not only a spectacular restaurant, but also a hotel. You simply must go and stay there. A link to the fifth and final section of out Tuscan adventure will appear here shortly.